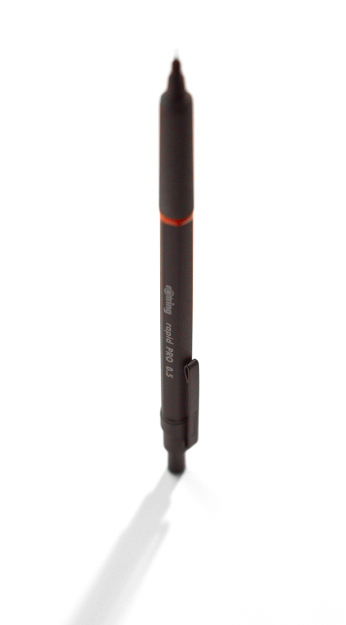 This is the Rapid Pro pencil by Rotring. In case you don’t know German, “rotring” basically means “red ring.” I’ve been using this pencil since March. It was the only thing I used when I was doing school work, so that basically means I used it (a lot!) for notes, homeworks, essays, etc. This one takes 0.5 mm lead, but Rotring has other versions as well, including a ballpoint. I think they should all roughly be the same. The barrel is metallic and it’s pretty heavy. I’m not sure what metal it is, but I think I read somewhere that it’s anodized aluminum or brass. The barrel is about as thick as an average wooden pencil. The top part of the pencil has a hexagonal cross section. There isn’t really a practical reason for this. It doesn’t stop it from rolling (the clip does that already), and it doesn’t help with the grip at all, so I guess it’s just for aesthetics? There’s an eraser at the top that’s hidden under a thin metallic cap. It’s held together by friction, and I found that the cap gets wider after use and will eventually start slipping off. I just give it a pinch every now and then to get it to grip better. One feature that’s very useful is something that Rotring calls the “cushion lead mechanism.” Basically, if you press down hard enough, a spring compresses on the inside that “cushions” the tip. You have to press down pretty hard to actually feel the spring compress, but I think it still makes a difference during regular use. It feels smoother to write with because the tip “gives” a bit, if that makes sense. The knurled metal grip on this pencil is awesome. It’s probably the best grip I’ve used so far. The Rapid Pro is really well balanced. It just feels like a well-designed writing tool. It’s hard to find anything wrong with it. When I was reviewing the Retrakt Pen a few days ago, I kept comparing it to the Rapid Pro. I got them for around the same price, but I think the Rapid Pro is better in every way. If you’re looking for a good pencil, go with this one! You might want to try out the ballpoint version too. I’m going to get one to try out eventually.